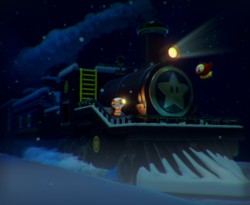 Blizzard on the Star Express is the 17th course of Episode 1 in Captain Toad: Treasure Tracker. This level requires 30 Super Gems to unlock, and it takes place on a train. Super Gem 1: Inside the third brown box at the start of the level. Super Gem 2: Behind a movable block in the living quarter guarded by a Shy Guy. Super Gem 3: Behind some bricks in the storage room; can be broken using the Super Pickax from the next room. If the camera is at the right angle, an 8-bit Luigi can be seen running on the tracks in front of the train. It was removed from the Switch and 3DS versions of the game. This page was last edited on April 15, 2019, at 13:31.